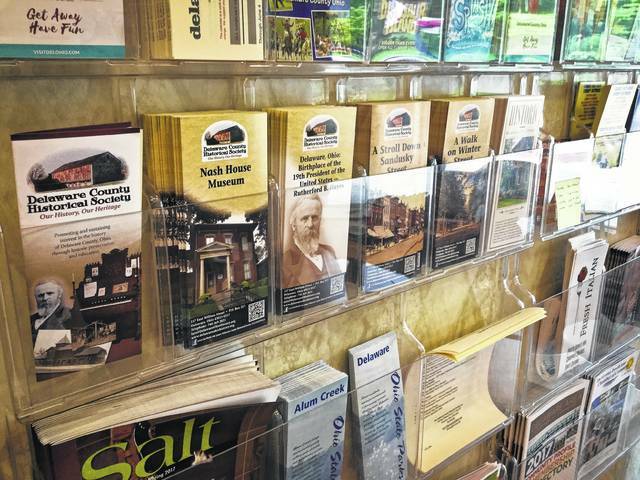 There are many brochures and pamphlets lining the wall of the entrance to the Delaware County Convention & Visitor’s Bureau. Delaware County is very a “family oriented and family friendly” place to visit according to Deborah Shatzer, Delaware County Convention and Visitors Bureau executive director. Shatzer said Delaware, Sunbury, Powell and Shawnee Hills are some great places for destination shopping. She said Shawnee Hills has several garden shops that shoppers can walk between. Shatzer said for the outdoor lover there is a lot of great water recreation. She said summer is great time for water recreation and that the big trend seems to be kayaking. Shatzer said Sunbury is home to several sites for history buffs, including the Fallen Heroes Memorial, the Civil War statue of Gen. William Stark Rosecrans in the town square and the old town hall, which is listed on the National Register of Historic Places. Delaware County has what Shatzer called an agri-tourism market. She said that just about every town in the county has a farmer’s market each Saturday through the summer months with Delaware holding a Wednesday afternoon market. Shatzer said there are lots of festivals and events to attend year round. She said there is the Classic Car Show, the Central Ohio Symphony Concert and Fireworks, Gardening and Arts Festival, the Ironman 70.3, the Street Market in Powell, The Little Brown Jug and the Delaware County Fair to mention just a few of the many events that go on each year. Shatzer said the county has 14 public and semi-public golf courses. She said the number didn’t include the private club due to they are not open to the public. Shatzer noted that Hidden Valley Golf Course was great place for someone to learn the game. She said it was where her children first learned and is still a nice place for beginners. There are also several wineries and breweries in the county that offer tours, Shatzer said, as well as tours at Stratford Farm where kids can collect eggs in the hen house. Several of the farms have pumpkin patches and hayrides — mainly in the fall — and one even has a zipline. Shatzer said there are also rainy day attractions like Sky Zone and Magic Mountain for the kids. Shatzer said according to a 2015 study by Longwoods International and Tourism Economics, tourism generated $1.3 billion in sales and sustained 11,349 jobs, creating $276.2 million in wages and $33.76 million in taxes collected for Delaware County. This entry was tagged delaware county, Fun, Tourism. Bookmark the permalink.